After years of working on adaptive reuse and complex development projects throughout the Twin Cities, we have learned that successful projects don’t happen unless you embrace the idea of possibility. Element’s typical brokerage process follows the same six steps regardless of the size of the project. The overall process is shown graphically below, which is based on a typical 5 -7 month process for securing a new space. This process can be shortened or lengthened depending on a tenant’s parameters and timeframe. Our process would begin with establishing the vision for your space. This would likely include a detailed meeting with your leadership group to identify and prioritize the basics of the lease requirement (location, size, future growth, amenities, aesthetics, price and lease term). The phase where we explore options can be as efficient or extensive as the team wants to make it. The type of space you are looking for will determine the factors that will influence the ultimate success of the space search whether it is office, retail or industrial. We use an integrated design approach as tenant advisors. By investing in developing a vision, exploring alternatives, thoughtfully evaluating options, and then negotiating the best deal, we can deliver the vision while avoiding unexpected changes that result from poor planning. We always evaluate total project costs for each option prior to sending initial counters to landlords, which helps to avoid major surprises. We feel that your best opportunity to influence cost and quality is early in the leasing process. 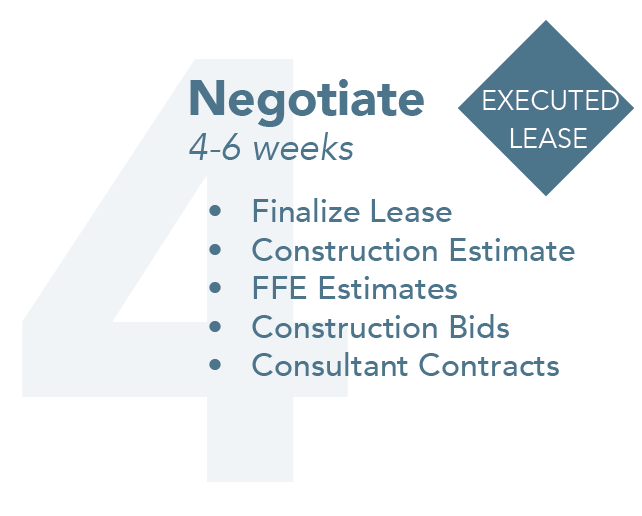 Element will work closely with you and your firm during the lease negotiation process to ensure that the final document reflects the executed letter of intent, and to offer any assistance to speed the deal towards final execution. After the execution of the lease, our involvement in overseeing the design and construction of the leased space can be as minimal or as extensive as you require. We have the experience to project manage the overall design and construction process as your owner representative, but we can also support your team behind the scenes if that is preferred.